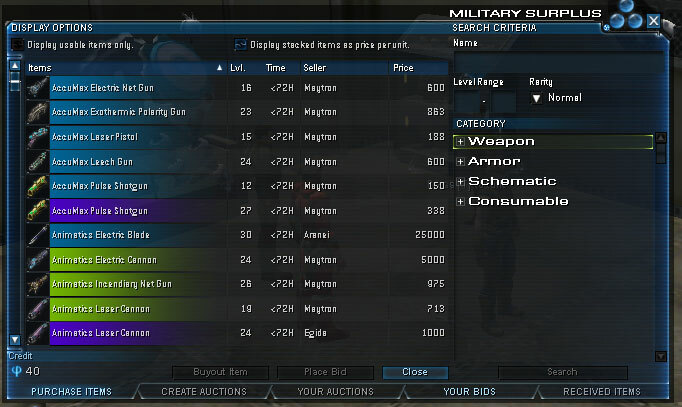 You can now buy and sell items from/to other players via Military Surplus. purchase, and place an item for sale. Audio: Tweaked volumes of several 1 liners so people can hear them better. player to select a new last name. Logging in or out while polymorphed should no longer cause a client crash. should be items that drop with up to 4 enhancements. Miasma: Ice debuff ability effect increased by 20%. Treelurker: Hit point multiplier decreased by 50%. Filcher: Hitpoint multiplier reduced by 66%. Amoeboid: Hitpoint multiplier on all variants has been reduced by 33%. creature will now be labeled as Amoeboid Spawn for clarity. Amoeboid: Primary attack ability damage has been increased by 20%. Warnet: Hitpoint multiplier on all variants has been reduced by 33%. to close to melee range. their melee range of 3m. in them being unable to ever use it consecutively. Reconstructor bot bosses will now employ their full range of abilities. battles (Maw vs Swampgrubber) due to damage type and immunities. grant resistance to snares, roots, etc. The juggernaught eye beam attack is now considered laser damage. difficulty and will no longer use googuns. Thrax Sharpshooters in Torden Mires should no longer glow. The mini boss Nakrinx in pools is now spawning correctly. escorts for multiple groups, simultaneously . scene switch more than once in order to view the codes. contains 3 EMP Resist Debuff modules. �A Traitor's Execution�, and �Trapped Like Rats�. Brann Plan�, and �Securing Security�. of Elimination�, and �Proof of Assurance�. Hidden Grotto�, and �A Holy Cave�. squadmates in Operation Maps should now be resolved. Mires should no longer have performance issues. have the full displayed time to get out of there. Logos Research: Added some more cipher crates throughout the instance. Awol Camp on Crucible now has hospital vendors. Guardian Prominence now has a hospital vendor. Opportunity� is now completed correctly. Warden bots will now more aggressively approach players. Incline Targets of Opportunity mission now works properly. prisoners in the proper place. Kardash Atta Colony loading screen should now have text. when escorted to the Fort Defiance entrance. longer aggro Thrax during ambush. Kill count objectives will no longer increment for kills on instanced maps. players from receiving the appropriate title when killing 100 Warnets. players from receiving the appropriate title when killing 50 Filchers. Updated Descent TOO mission to give correct completion title. Added NPC to bootcamp to explain chat. Fixed "Main Computer" inside Live Target Pens. of the map and added a few more patrolling predators. of the old and young persons. that failed will be teleported. player completed in the event the instance doesn�t reset. kill the boss before you can take the control point. All temples: Fixed issues causing the teleporters not to work. area that was making the mission too difficult. have a spear, but should have. Updated the Target Painting debuff tray tooltips for brevity and accuracy. Added duration information to the Rage ability tooltips. Corrected the Adrenaline consumption rates for Sprint ability tooltips. �unknown� icon and now uses the ability icon. 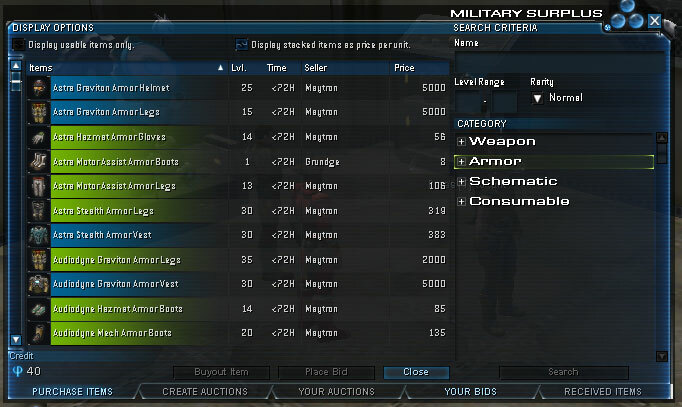 Micromech listed in its tooltips. Leech Gun skill tooltips are now more accurate. 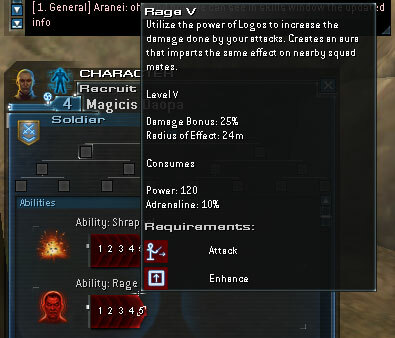 Rage tooltips are now more accurate. All pump levels of Polymorph now have stronger armor. Polymorph Kael retains immunity to Knockback and Stun. into the account does not allow the player to select a new last name. default chat tab names will now be localized when the language changes. order of tabs in the character window. talk" if targeting an NPC. disabled options will now have tooltips when moused over. pool after a polymorph until combat. added chat bubble display for squad chat. added voice chat indicator to chat bubble display. animation due to odd ammo counts. client if it was unequipped & reequipped. escorts will now have a separate radar indicator. The explosion from Self Destruct should correctly display now. between instances of the same map. the accept and cancel button for the alpha slider should now work. clan tabs in the social window will now highlight with the correct icon. Fixed bug where damage caused by pets are not shown in chat window. pictures will be sorted into dated folders. added French and German general chat. Ranger Reinforcements are not doing melee damage. midair without anything to blow up. The Rage ability description is incorrect. until you log out and back in after creating a new character. Some Exobiologist skills do not work correctly in PvP. target the center fuel lake. Weapon Damage debuffs (via Crafting) are not debuffing. are being awarded the correct amount of pump points. dropships do not always give mission items. You must disable your profanity filter to play on the Descent map. disconnected from the server during the mission. 25% at pump 5 and 10% adren cost !